I have avoided many coffee cake recipes because I look at the topping and see big chunks of some sort of nut and I think, “Picky eaters in my house will not eat that.” Then I sigh and move on. But let’s be honest here, I’m one of the picky eaters. I like the idea of nuts. I know they are healthy. I just don’t want them mixed in with my sweet stuff. There, I said it. But the great news is this: I solved the nut problem. Cracked the nut, so to speak. The solution is this: Put the nuts (walnuts in this case) in the food processor and grind them up – go as far as nut butter if you desire. Then add them to the rest of the crumb. Once I solved the nut problem, the next thing I had to consider was the fact that the recipe calls for ground cardamon. Every time I think I need cardamon, I go to the store, plan to buy it, and then I say, “$11.99?!?!?!?!?! I think I have some old cardamon pods in the spice drawer that I can just grind up instead.” But then, of course, I just make something else. This time, I went to the store knowing my history and planning to buy the cardamon no matter what. But I said, “$11.99?!?!?!?!?!?!? !” Then I said to myself, “wait, now that King Soopers has the worlds dumbest floor plan, is it possible if there is another section of the store with spices that are cheaper?” And the answer was yes. I found cardamon in the fancy-wooden-floor-natural-food-aisle for $3.49. And because I am turning into quite the breakfast flavor aficionado, I served the boys their coffee cake with some bengal spice tea, because it also has cardamon, and is caffeine free. It was a huge hit. The picture makes the cake slice look really small, but actually the strawberries are monstrous. Oh, the recipe… it’s from Baking. This entry was posted in food and tagged breakfast, cardamon, coffee cake on May 5, 2017 by metamegan. Last Friday we were on SPRING BREAK!!! WOOOO!!! And we had breakfast at The Creekside Cafe in Steamboat Springs, CO. We love it and we try to eat there every time we are in town. That’s a picture of Dave’s breakfast. I had a cinnamon oat pancake, Speaking of Creekside, the school fundraiser is coming up and I donated 1 fancy breakfast Friday. I offered to make one of two cakes or any muffin from metamegan.com. Because of the almost five year spread in ages, we will spend 11 or so years at Creekside, and I count down the time we have left there in spaghetti dinners. (Three spaghetti dinners to go.) Since I didn’t make anything last week, and I needed to bring together a list of options for the lucky auction winner I present to you: A Coffee Cake and Muffin Metamegan Retrospective here. Please feel free to browse these past delicious recipes! OR any muffin. Such as Banana Blueberry, Snowboard Muffins, Activist Muffins, Pumpkin Muffins, Rice Muffins, The Perfect Muffin, Blueberry Cornmeal Muffins, Blueberry Muffins, Orange Blueberry, Next Level Higbee Muffins or Pumpkin Chocolate Chip Muffins. This entry was posted in food and tagged coffee cake, muffin on April 7, 2017 by metamegan. 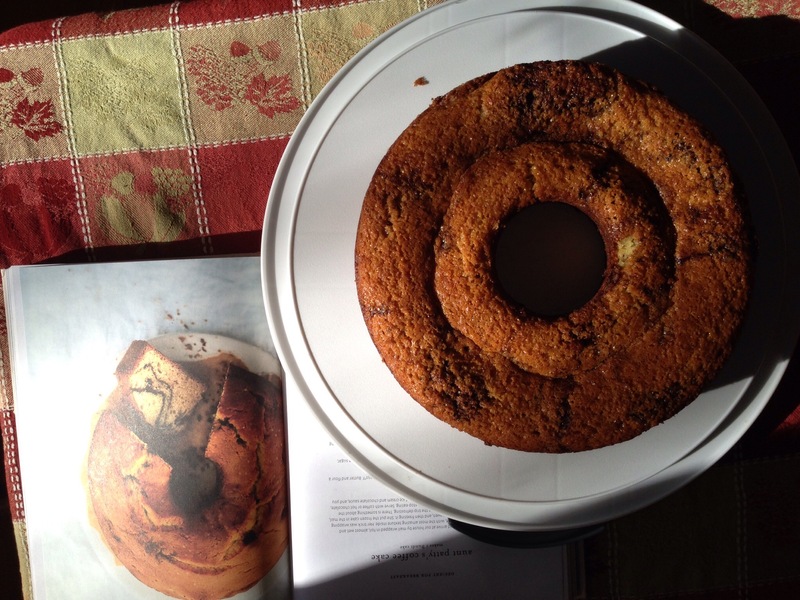 I made “Aunt Patty’s Coffee Cake” from my cookbook Mad Hungry – Feeding Men and Boys. I bought that cookook or maybe asked for it for Christmas because the author writes recipes for Martha Stewart, and Martha Stewart recipes always turn out. (Except for that one time.) However, I do think the title is weird and sexist, and an obvious marketing ploy, but whatever, it worked on me. I like thinking of myself as this “mom” who cooks for her “boys”. But there is a chapter titlled Boy Salad. Come on. i have made a lot of recipes out of this book and they are all pretty good though. I can’t complain about the coffee cake, it was amazing. The filling was cocoa/sugar/instant coffee – I used instant esspresso. I thought it might be too bitter for the boys but they loved it. The only weird thing about it was that it said to pour 1/3 of the batter into the pan then do the filling, repeat etc. I didn’t find the batter to be pourable. I had to glop the batter into the pan. And by the time I had the bottom of the bundt pan covered, I had used more than half the batter. I didn’t get perfect swirls of filling for that reason. In addition to the coffee cake, last week I baked cookies, a birthday cake, and made another round of the chocolate chip brioche pretzels. I had just said, “Maybe we should take a break from baked goods for bit, at least until Thanksgiving. But then my neighbor called and said. “I have a lot of eggs, can I bring you 30?” I said, “SURE”. So the break is over before it started. This entry was posted in food and tagged breakfast, coffee cake on November 20, 2015 by metamegan. I think what sold me on this recipe was the name. It sounds so good. Fluffy. Caramel. But the theme of my life last week was “cooking things in the wrong size pan” and consequently I made some delcious things that were not pretty enough for a photograph. Fluffy Caramel Coffee Cake was from the book The Breakfast Book by Marion Cunningham, which was a gift from my friend Laura, and I love it. It’s one of the only cook books that I like to read just for kicks. In fact the very first FBF recipe for waffles 11 weeks ago was from the book. I like that Marion says what to do the night before and how to handle the rest of the steps in the morning. Exactly what I was wondering about two weeks ago. I also like that this is a yeast bread which gives it a cool flavor and creates the fluffiness. The problem is, I brought a 9×9 dish to the party and I left with an 8×8. So I thought my pan was a little too small but it was a lot too small. I woke in a cold sweat, worried about the size of my pan and the bread overflowing. I told myself, “Self. Measure the pan. If its 9×9, just go with it. If it’s 8×8, move the whole thing to a 10 inch spring form pan.” Well, it was 8×8 but I could clearly see that trying to move the dough would cause a massive deflation and would not be worth the effort. Long story short, it was good, but too sweet. Jack said it was the perfect amount of sweetness and that the cake had a sourness to balance it. He was sort of right because of the yeast flavor, and the sour cream in the topping. But I had to eat mine with bacon and black coffee to balance the sweetness. I made a note “too sweet” and I probably won’t make it again. I’ve already staged my comeback with another coffee cake for next week. I had planned croissants at Laura’s request, but all the birthday baking I have going on got in the way. What else do I need to make? Scones? French toast? Frittata? This entry was posted in food and tagged breakfast, coffee cake, fail on November 13, 2015 by metamegan. Fancy Breakfast Friday is going strong 3 weeks in. Last week’s breakfast was blueberry buckle with vanilla crumb with a side of breakfast sausage and an egg made to order. I had to go overboard on the protein since I was basically serving cake for breakfast. The recipe is from this cookbook: Rustic Fruit Desserts. I’ve also made the strawberry shortcake from that cookbook and it is amazing. I had mixed results with the plum cake. This recipe is actually for a cranberry buckle, and the reason I initially made it was to use up cranberries during the holidays, but the cranberries were just way way too tart. Blueberries make this perfect. It also calls fora 9×9 pan, which I don’t have. So I did a lot of calculations lxwxh, a=piR2 etc to convert 9×9 to either 8×8 or 10″ round or 9″ round. I think I determined the 10 inch round pan was the way to go last time, but this time, I used the 9″ round because I seem to have short term memory loss. It turned out perfect and delicious, but I had to cook it for a year and a half, checking every 5 minutes to see if it was done. 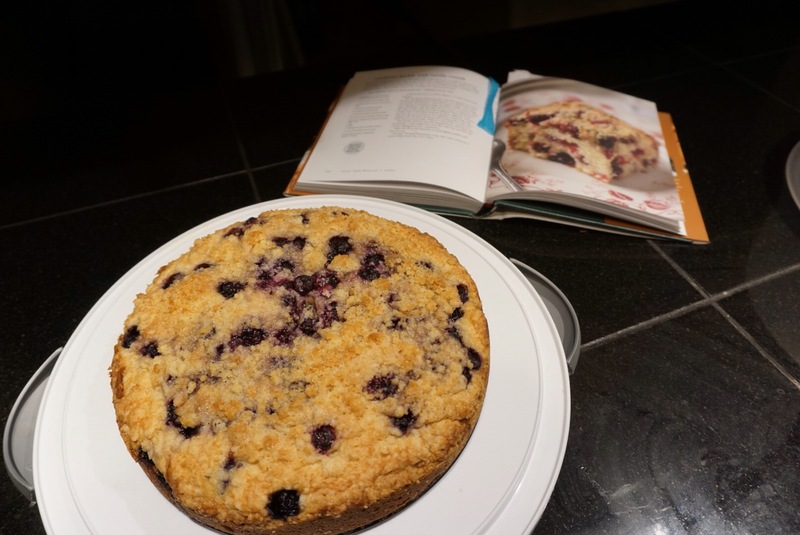 This entry was posted in food and tagged blueberry, breakfast, coffee cake on September 11, 2015 by metamegan.